contact us for pricing and or to locate nearest dealer. we can be reached at (269) 382-2050. The Kalamazoo Industries model KM14HS 14 inch manual high speed non-ferrous mitre saw that can mitre non-ferrous materials such as aluminum, brass, or plastic 45 degrees left or right. 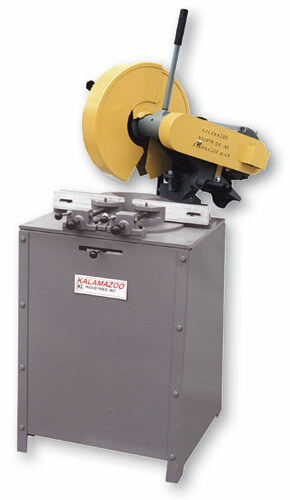 The saw, now part of Kalamazoo Industries’ standard equipment line, originally was built to a customer’s special request for a rugged, high capacity, high spindle speed saw. The Kalamazoo Industries model KM14HS 14 inch manual high speed non-ferrous mitre saw features cast iron construction, 4400 rpm spindle speed, sealed ball bearings, dual V-belt drive, and dual cam vises that open to 6″. Capacities are 2”x 6” at 90 degrees, and 4”x 3.5” at 45 degrees. The saw is available with a powerful 5HP motor in 220 volt 1ph, or 220/440/575 voltages 3ph. KM14HS 14 inch manual high speed non-ferrous mitre saw is great for aluminum, brass, plastic and other non-ferrous materials! 14″ high speed non-ferrous mitre saw (LESS HIGH SPEED NON-FERROUS BLADE). Mitres 45 deg. left or right, cast iron construction. 4400 rpm spindle speed, sealed ball bearings, dual V-belt drive. Kalamazoo Industries KM14HS High Speed Non-Ferrous Cutoff Saws.